At 6:19 in the morning on September 16, 2030, an enormous nuclear accident occurred at the lakeside research facility LABO (6th Laboratory of Atomic and Biological Organization) in Kanarashi, trapping 9 individuals underground. The exits were tightly locked due to a security malfunction and many mysterious phenomena keep happening and the survivors begin to die one by one. There are two routes to the story: the leader of the rescue team Watase who lost his memories, and a high school student Natsuhiko. With the knowledge of both sides, will it be possible for all 9 of them to escape safely? – Hau~ Omochikaeri~! 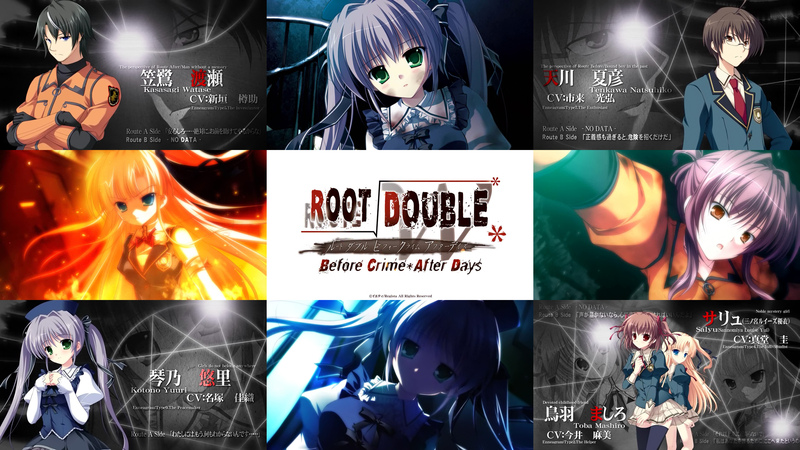 Root Double is being ported and released for the PC on September 28th. There’s a 99.99% chance a group will pick it up and translate it. Why am I so certain? Because it’s from Takumi Nakazawa, director of the Infinity series, whose other works include Never7, Ever17, and Remember11. There are far too many fans to let this one slip through the cracks, I would think.